According to African legend, white lions are messengers of the gods. It seems that the gods looked favourably upon the white lions introduced to Sanbona Wildlife Reserve and blessed them with a triplet of white cubs. This lion family is free to roam and hunt in a 5 000-hectare section of the reserve. This alone is rare and special, and so is the very land on which they hunt. 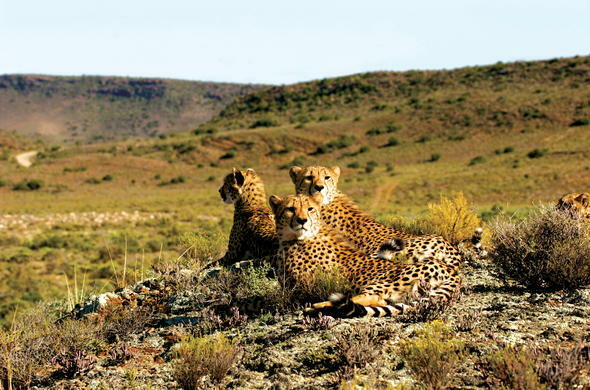 A mere three hours' drive from Cape Town in the Western Cape, Sanbona Wildlife Reserve lies at the foot of the Warmwaterberg in the Little Karoo, a semi-arid region where plants and animals have evolved over millennia to create a diverse and unique environment. Seemingly inert, the plains and hillsides burst into life between August and November with a show of brilliantly coloured flowers triggered by spring rains. There is a palpable feeling of history at Sanbona, not only from the occasional tumbledown cottage curiously sited in the middle of nowhere, or the Georgian lines and interior decor of the manor house or the African proverbs on your pillow at night, but also because the rocks themselves hold the history of the San (Bushmen) whose ancient art adorns hidden over hangs.Catch some of the worlds rarest wildlife sightings in Sanbona Wildlife Reserve which is home to some of Africa's white lion prides.There are seven rock-art sites throughout Sanbona dating back more than 3 500 years. These sites can be visited on game drives, but you may well be distracted by the elephant and buffalo that wander the reserve's 54 000 hectares. Semi-habituated cheetah can be tracked on foot for a thrilling close-up encounter. Conversely, you may become enraptured by the little creatures and plants that thrive in this parched land, or even find fossils from a long-distant past when these hills and plains were part of the seabed.